What is it about a clothesline that makes my heart skip a beat? I love hanging my laundry out in the sun- heck- I even like hanging it out on clear, crisp winter days! My Mom used to hang our laundry all the time. 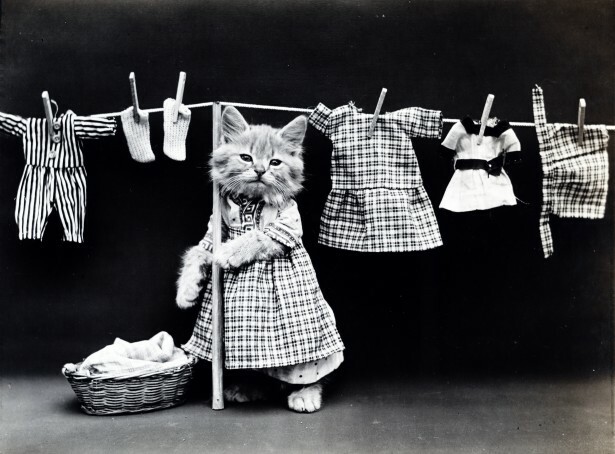 When I was old enough, doing the laundry every Saturday morning became my responsibility. We didn't have a washer and dryer. We used a wringer washer and two large metal tubs, and hung the laundry on a clothesline. I was a senior in high school before we got a washer and dryer. I really like the old wringer washing machines. I used one for a few years when some of our children were babies and in cloth diapers. I think our clothes came out cleaner. I have also been known to use a bucket and a plunger in a pinch! I kept a separate plunger for just such emergencies. The bathtub works great if you have a lot of laundry. Contrary to popular belief, I have never had to resort to beating my laundry on the rocks by the river! There is something very satisfying - almost cozy, if you will - about a line of freshly washed laundry hanging up to dry! I remember in one of my childhood homes, there was a large wooden rack on a pulley system hanging from the ceiling, next to the oil burning stove in the kitchen. This is how our laundry dried in the wet weather. I would love of those in my kitchen near a wood burning cookstove! My home never feels complete without a clothesline of some sort. I have had many different types of from the reel ones that needed the metal line tighteners to keep lines taught to thin rope tied around trees in the backyard. Right now I have an umbrella clothesline. I love it! Thank you to son number 4 and our neighbour for getting it into the ground for me! The neighbour wasn't even through the gate before I had a basket of sheets, pillowcases and towels up and blowing gently in the breeze! There is nothing to compare to fresh, sundried bedding for a good night's sleep! As I am writing this, there is a good, strong wind blowing outside - excellent for drying the heavier blankets and quilts on our beds.I would really love to gather them all up and run them through the washing machine and hang them on the line! Alas, it isn't 6am yet, and all beds are being used. I am sure none would be too happy to oblige me by giving up their blankets!